The Azimut 85 Ultimate is advertised by the Avigliana-based yard as a "private club on the sea". Actually, the advertisement perfectly reflects the design and construction spirit of this motor yacht. It is a private club because the outside areas of the boat are logically connected with the interiors even if the first are for open-air activities and the latter for life in enclosed spaces. The logical and rational layout is enriched by the sophisticated elegance of forms and ergonomics. 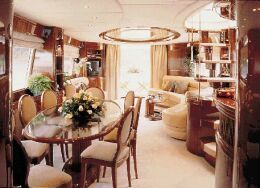 The beautiful stern area includes large transom garage, two cockpit-access stairwells, one table with sofa and high-tech mooring stations. The flying bridge includes aft Jacuzzi tub and especially designed aft pulpit. Amidships, there are one oval table, a large sunning area, one access door to the salon and a full bar cabinet aft of the large helm station. Forward, the deck is in teak and there is a sunning area and a large settee. Interiors are comfortable and sophisticated. The salon is on two levels: the detailing of lights, recesses and elegant shapes is superb. There are two beautiful opposite settees aft, the access ladder to the flying bridge is in wood and transparent polycarbonates, the galley is recessed to port. Opposite, separated by a practical worktop, there is the dinette. Forward, there is the large helm station, a comfortable U-shaped settee and access to the cabins is gained via the stairway. There are 4 ample cabins with special attention to detail. The crew quarters are aft. They are very well connected with all technical areas of Azimut 85, such as the engine room, the control room, the transom garage and most storerooms. We have often described Azimut boats in the small to medium-size range as "small large motor yachts": the 85 ultimate is a large motor yacht with features and size of living spaces typical of "small large" leisure ships. Draft from lower tip of propellers: 6'4"
Full boat displacement: 166,225 lbs. Total engines and reduction gears weight: 13,245 lbs. Galley: double stainless steel sink, granite worktop, extractor, four ceramic hobs, combined multifunctional oven, refrigerator and freezer, dishwasher, cupboards and cabinets, sliding access door, access door to port side deck, communication window with the dinette. Standard fittings: water heater, air conditioning in all cabins and living spaces, bow thruster, refrigerator and icemaker in the salon, 21' color TV set with VCR and hi-fi system with CD player in the salon and in the master suite, 14' color TV set with VCR and hi-fi system with CD player in the VIP cabin and hi-fi system with CD player in the two guest cabins, two 25-kW Kohler generators and CO2 fire-fighting system in engine room. Docking maneuverability: excellent thanks to the bow thruster and to the rational and efficient layout of the forward and aft mooring fittings. Electrical switchboard and plants: top quality and extremely reliable components and plants.